Back in 1995, Dogfish Head Craft Brewery approached AC Beverage to build a draft system that could pull directly from their aging barrels. Earlier this year, that system hit the market as the Rack AeriAle system. We had a chance to partner with AC Beverage this April for Eataly in Boston, installing it in the newly opened Terra restaurant. We wanted to offer our experience with the AeriAle system, and why it’s a great choice for restaurants, bars, and taverns who want to show off their barrel aged ale. Barrel-aged beer is a big market: over one-quarter of the top 51 beers in America are aged in wooden barrels according to Men’s Journal. Once these casks are finished aging, they are transferred to steel kegs for dispensing. Until the Dogfish Head – AC Beverage partnership, this transfer to kegs was the only way to tap this beer, to have the pressurized and chilled beer lines function properly, especially with the gas blending systems involved. 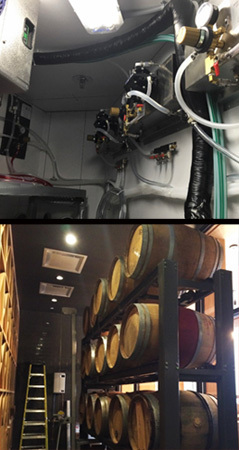 The AeriAle system makes it possible for beer drinkers to enjoy the beer directly from the barrel, and for restaurants, bars, and taverns to directly show off their barrels. The system starts with a Nitrogenator, which provides a mixed-gas pressure that feeds into both the barrels themselves and for beer line pressure. 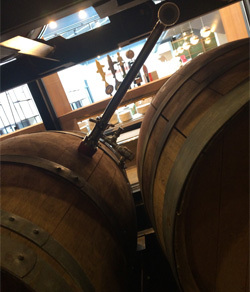 Customized barrel extractors (based on similar systems used in wine barrels) pump the beer under low N2 pressure into a heat exchanger, chilling the beer to its optimal temperature. The beer then feeds into a CellarStream – an in-line liquid & gas contactor that provides gas-blending for the beer. Depending on the brew, this could be anywhere from crisp carbonation to a velvety nitro-blend such as found in a Guinness. Then the brew feels into a standard draught dispensing system, using a slow-pour faucet fitted with a restrictor that strips out the excess gas when it is poured. During this most recent Eataly, we worked with AC Beverage (who owns the system and sells it to installers) to install this system at Terra. The Eataly event occurs in four places in the US, three of which feature beer: Eataly Boston is no exception. 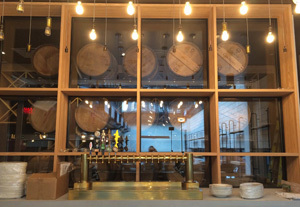 Terra made news during its debut from the Rack AeriAle system, which showcased the beer being directly from the aging barrels which could be seen behind a glass partition. It was a fairly smooth install and allowed them to showcase barrel-aged beer in a unique way. 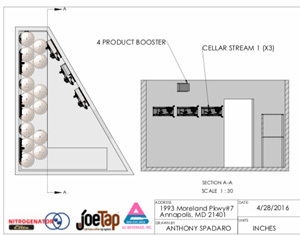 Interested in getting a Rack AeriAle system installed in your restaurant, bar, or tavern? Clean Beer can help. From displayed racks of barrels as are featured in Terra, to mini versions featuring one barrel tapped for dispensing and one for aging, we can work with your establishment to showcase barrel aged beer. Contact Clean Beer today for more information and a consultation of the best draft systems for your business.